While stocking up on key items for our Galapagos cruise, the eternal fiancée of the skeptical cardiologist (EFOSC) bought an item that set off the skeptical cardiologist’s (extremely sensitive) BS detector. Once I began looking into the seasickness treatment options and science I soon realized that the vast majority of OTC medications, patches and devices offered are snake oil. There is one highly effective treatment which requires a prescription, one possibly effective OTC treatment which will likely put you to sleep, and one very slightly effective treatment which will also likely put you to sleep. First let’s look at the totally bogus patch Jen purchased. It also carries the allure of being natural which people (mistakenly) assume means free of side effects. Since most people have heard of an effective motion sickness patch, they naturally assume that this is legitimate. It appears to be highly rated on Amazon with 80% of over a thousand reviewers giving it 4 or 5 stars. However, 10% of reviewers give it 1 star, usually commenting that the MQ patches were useless and were purchased as they were cheaper than the prescription patch that worked for them before. And it is no surprise that it doesn’t work for many because the ingredients would not be expected to have any effect on motion sickness. safflowertall,gastrodia,tuber,sanchi,hairy datura flower,borneol,pinellia tuber,obtuseleaf cinnamon bark,frankincense,dahurian angelica root,etc. Yes, in these patches you get the added bonus of “etc.” in the formulation! 1. Adjust the control of the vagal nerve to gastrointestinal tract, inhibit the motility of the gastrointestinal, thus preventing nausea and vomiting. 2. By expanding the capillaries of the skin, to improve the microcirculation of body and increase the amount of oxygen to brain, thus comes to the effect of refreshing your brain. After reading the reviews for the MQ patch and listening to an NPR story on paid Amazon product reviews my faith in Amazon product reviews is at an all time low. Similarly, most of the sites on the internet which promise to give you the top 10 products in a certain area I have found to be bogus. 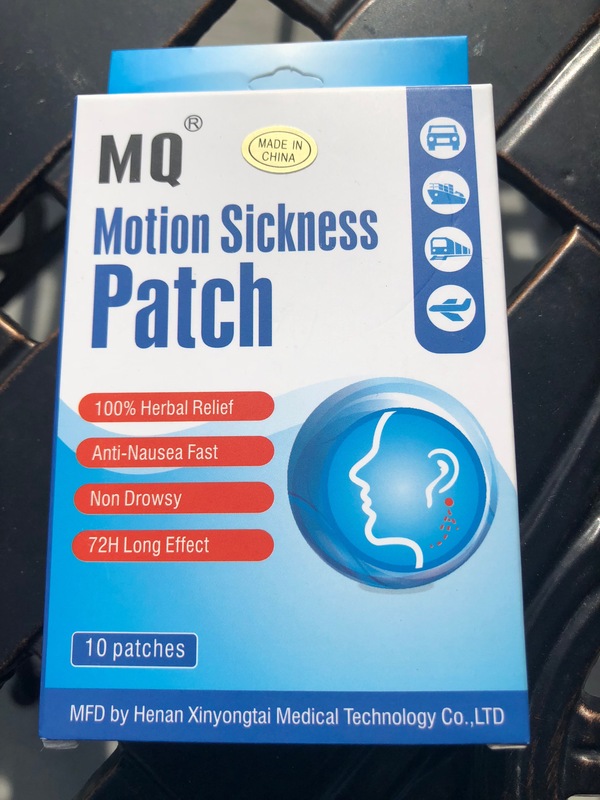 For example, the amazingly useless MQ motion sickness patch is ranked #5 on the “Best Reviews” Guide to Motion Sickness. The second product the EFOSC purchased online was the oddly-named Bonine. Bonine is the brand name for meclizine, a first-generation antihistamine with anti-cholinergic properties which is often prescribed for benign positional vertigo. There is not much evidence supporting meclizine for sea sickness but it is widely used owing to its accessibility and marketing. Like all first-generation antihistamines, it will make you drowsy. Before the second generation, non-sedating antihistamines were introduced, I would walk around in a zombie-like state when my allergies required an antihistamine. Keep in mind you can get a prescription for 30 tablets of meclizine 25 mg for about 12$. More evidence that the placebo force is particularly strong in the motion sickness world is the widespread marketing, sales and testimonials to “acupressure” devices. The EFOSC with her Sea Band. She likes to wear it because it is blue and white, her favorite colours. The EFOSC suffers from car sickness and several years ago purchased something called the Sea Band. 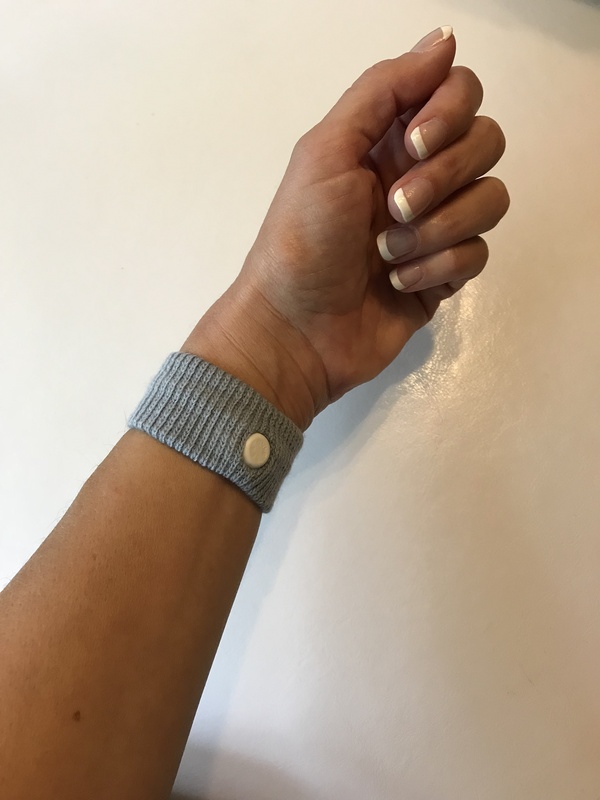 Wrist bands like the Sea Band claim to reduce nausea and other symptoms of seasickness through stimulation of the “P6/Neiguan” acupuncture point by applying acupressure or electrical acustimulation. These work primarily through placebo effect and studies have shown a “sham” acupressure band works as well as a real one. The EFOSC is gravely concerned about debilitating seasickness during our 8 days on the Samba. To maximize the placebo force in her I should have emphasized how well the Sea Band and the MQ patch work. Hopefully she won’t read this post. In Part 2 of the Best Seasickness Treatment I’ll discuss transdermal scopolamine and dramamine, the treatments with the best evidence for efficacy, safety and tolerability. I’ll also examine the evidence for ginger. What’s been your experience with sea sickness and treatments for sea sickness?